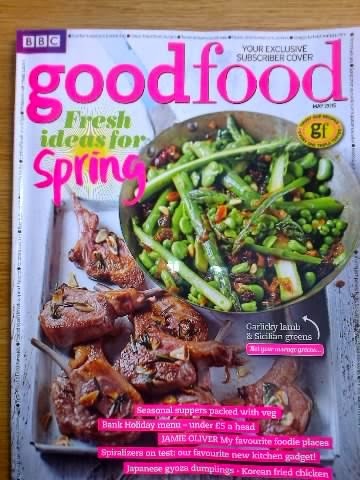 Spring is still the focus for this month's Good Food, with lots of lively outdoor recipes for picnics and entertaining al fresco. Asparagus gets the editors vote as she promotes everything that is green! This month's news, reviews, trends and best buys feature cookery schools, Real Bread Week, and Trendspots 'Raw Food'. Of the new cookery books reviewed, I liked the look of 'How to Cook Bread' by Leighs Food and Wine. This book helps you develop new baking skills, by adding different flours and flavours to a loaf, the technique for croissants and making the perfect Chelsea buns. On the same page, 'Holly's Trolley' introduces readers to date granola, sheep's milk cheese and pure fruit bars only 59p from Holland & Barrett. And don't miss wine notes, with Sarah Evans looking ahead to English Wine Week - it seems we have a 'week' for everything these days! Devoting two pages to photos and commentary to Good Food's Staff Party to celebrate 25 years of the magazine is rather excessive and pompous - are readers interested in seeing the editor and her team in their party frocks, rubbing shoulders with ex Great British Bake-Off winners and a few well known chefs? As for reprinting Food Writer Jack Monroe's tweeted tribute to the party, what a waste of space! Admittedly the section given over to 'Game Changers' was interesting - such a pity that readers were not asked to name their game changers instead of the editorial staff. I would have agreed with some, like Michael Mosley and Budget supermarkets, but as for Veg box delivery and James Martin, they would not be on my list. 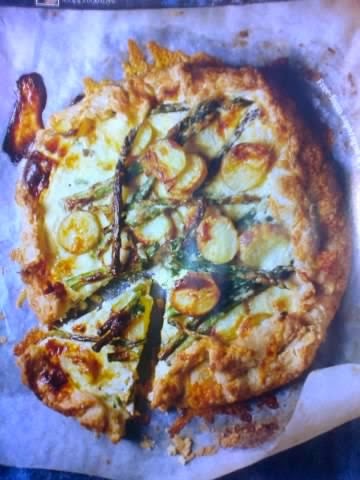 The 'star of the month' asparagus recipes look great - the Free-form asparagus and potato tart caught my eye (above) but the Asparagus, avocado and quinoa superfood tabbouleh looks a real summer treat, if you are looking for something a bit different for that outdoor spread! Less inspiring for me are the tofu dishes.I don't know what it is about tofu but it rarely gets my taste buds racing. Admittedly, Good Food offers recipes beyond the normal stir-fry dish. 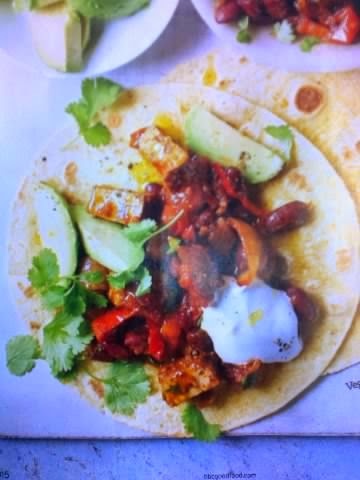 Smoked tofu tortillas look okay and certainly they could get you salivating if they turn out as per the magazine photo (below). However, I learnt a lot about tofu from this section - from choosing the right tofu to how tofu is made. Jamie Oliver's Notebook is worth a miss unless you reside in London. Unsurprisingly, all his favourite places to eat, drink and shop are in the Capital and there is little we haven't heard before about The River Cafe, Fifteen and good olive oil. In contrast in the Seasonal and local section, there some very readable snippets on sheep's milk products, rapeseed oil and allotments. You'd guess I'd love the latter - always interested in comparing my allotment experience with others around the country. Sadly, acquiring you own 'food lovers' haven is not as easy as the article suggests. 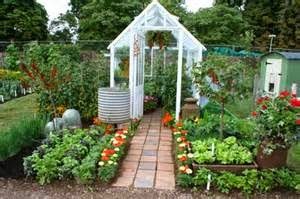 Most local authorities and community garden associations have very long waiting lists for allotments. You just have to keep trying and waiting! I guess most of the women featured in Good Food's article on the WI wouldn't need the magazine's '25 ways to greener kitchen'. Nevertheless, it was a good quick read and does help one modify practice in the kitchen, if only to use the right ring for your pan on the hob. Equally useful were the 10 favourite garden centre cafes. Not only did they go UK wide, there was a pleasing absence of London and the South East, proving the UK does not end at Watford! As you would expect this month's magazine abounds with recipes - simple dishes, vegetarian meals and chef's specials. However, the deluge of dishes for outdoor eating is a delight. 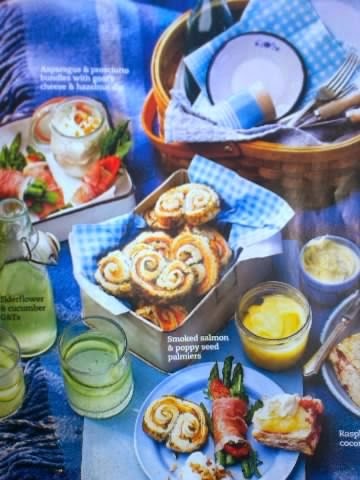 Picnic food, like tarts, salads and scones take centre stage. There is a 'Posh Picnic for Two (below), providing everything from Smoked salmon to Elderflower and cucumber G&T. A 'Lighter Picnic for Six' goes down the calorie-controlled route with Fennel, pomegranate and broad bean salad and Pastry-less pork pie. If you are a family of four then there is also a picnic for you - more child friendly food including Blueberry and mint iced tea and Coronation drumsticks. Famous chef's get their page space too - Richard Corrigan does 'thrifty food, while a slimmed down Tom Kerridge cooks a fish dish for his wife. Kids will love the Cake Club's Queen of Hearts cake and if you can run to matching china then your Alice in Wonderland picnic will be almost the real thing! And if you can get your children cooking dinner, like this month's 'Let your kids cook', then you can vacate the kitchen. Haven't we seen Good Food kids cooking Lasagne and Crusty garlic bread before? Finally, a mention of Anna Jones's 'My Kitchen' - the former Jamie Oliver trainee is unsurprisingly based in London, a vegetarian and a lover of cactuses. Such a pity we could not see more of her kitchen as oppose to photos of her window sill, her pans and her shelves. With a table that seats 14, it must be a massive room!